Paris' 8th arrondissement, or district, on the Right Bank of the Seine is a bustling center of commerce, world-class hotels, and elegant architecture. It is also the home of world-famous attractions like the Arc de Triomphe and the Champs-Élysées. 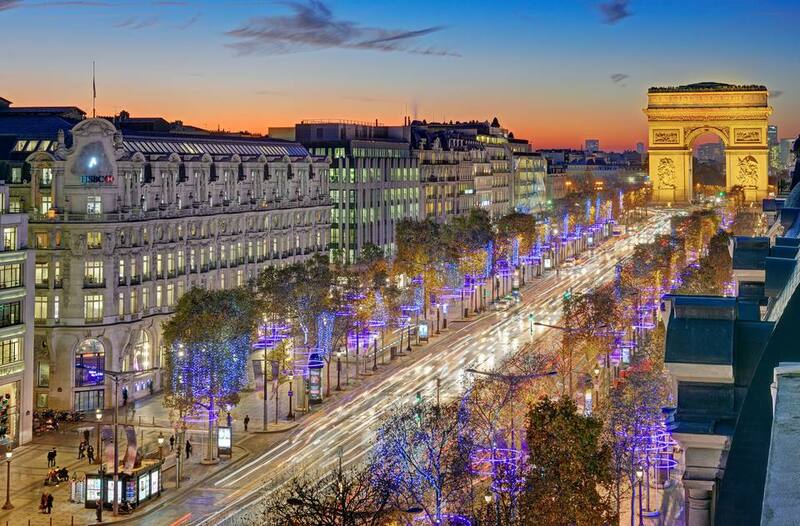 No visit to Paris is complete without a long walk down the wide, tree-lined, elegant boulevard, the Avenue des Champs-Élysées. Created in the 17th century by King Louis XIV, the avenue begins at its eastern end at the Place de la Concorde, Paris' largest square. From there, it cuts a perfectly straight line 1.2 miles to the west where it ends at the Arc de Triomphe, one of Paris' most famous icons. Along the way, there are palaces, museums, and great shopping at high-end designer establishments like Louis Vuitton's flagship store and Cartier's, as well as the usual international chain retail establishments like Gap and Sephora -- you can even buy a car at the Citroen showroom or an ounce of expensive French perfume at Guerlain. This iconic Paris monument was commissioned by Napoleon in 1806 to celebrate the French army's victory at Austerlitz. It sits at the western end of the Champs-Élysées at the center of the Place de l’Etoile, so named for the 12 radiating streets that converge at the monument. TIP: Do not try to access the arch by crossing the heavily trafficked streets. Use the convenient and safe pedestrian tunnel from the north side of the Champs Elysées. Beneath the arch is the Tomb of the Unknown Soldier. The monument's eternal flame commemorates the dead of the two world wars and is rekindled every evening at 6:30 p.m. Admission to the monument includes access to the top of the arch for spectacular panoramic views of the city day or night. The magnificent Belle Époque-style Grand Palais was built in three short years for the opening of the 1900 Universal Exposition. Famous for its huge glass dome and art deco ironwork, the Grand Palais has three different areas each with its own entrance: The main gallery displays contemporary art from all over the world; the Palais de la Decouverte is a science museum; the Galeries National du Grand Palais is an exhibition hall. The glass-domed gallery hosts a wide variety of events, including contemporary art exhibits and designer fashion shows, while the national gallery exhibits large-scale art exhibitions featuring modern masters such as Picasso and Renoir. Across the street, the Petit Palais, also built for the 1900 Universal Exposition, was intended to be temporary, but the eclectic Belle Epoque building was so popular with the Parisians that it stands to this day. The building houses the Musé des Beaux-Arts (Museum of Fine Arts) with its collection of 18th- and 19th-century paintings, including works by the great French painters Delacroix, Monet, Renoir, Toulouse-Lautrec, and Courbet. The art collector, Edouard André, and his wife, the artist Nélie Jacquemart, traveled widely and acquired rare works of art. Just off the Champs-Élysées on the elegant Boulevard Haussmann, the often-overlooked Musée Jacquemart André is housed in a magnificent 19th-century mansion. The collection includes Flemish and German artworks, frescoes, elegant furniture, and tapestries, but the museum is most famous for Nélie Jacquemart's private collection from the Renaissance period in Florence and Venice, which takes up the entire first floor of the mansion. Take a break from shopping and sightseeing on the Champs-Élysées to join the Parisians in this pretty park with its trees, blooming gardens, and numerous statues. There are also a pyramid, a large pond, and playgrounds for kids. Visitors enter through huge wrought iron gates decorated with gold. Admission is free and the park is open until 10 p.m. in summer. Parc Monceau is surrounded by elegant mansions, including the Musée Cernuschi (Asian Art Museum). It is popular with families who live in the 8th arrondissement, as well as with visitors to this area of Paris.